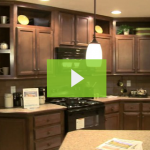 Home » How Are Manufactured Homes Built? When you picture a house being built, you likely see a bunch of guys swarming over a slab foundation in the middle of a muddy plot of unfinished land. They frame the house, raise trusses for the roof, form the exterior with plywood, shingles and siding, then move inside for the Sheetrock, flooring and final touches. The process can take months and cost a fortune, and, during a good portion of it, the home is exposed to the elements, leading to potentially costly damage. But there’s another option. Thankfully, questions like “how are manufactured homes built?” prompt a more secure picture. 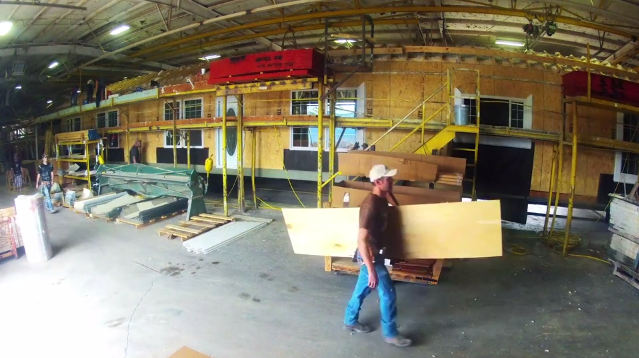 How Are Manufactured Homes Built inside the Factory? Unlike the standard site-built house just described, a manufactured home is built entirely inside a huge, climate-controlled factory by a team of trained craftsmen with experience bringing each design to life. In every factory, strict quality assurance and supervision of each step of the process ensures a well-constructed product that meets high federal HUD standards for quality, energy efficiency and durability. The first step in the process is the flooring, which is built in sections, each attached to a permanent chassis with its own wheels and secured for transport upon the home’s completion. Depending on the size of the house and the floorplan’s layout, there may be two, three or even four sections. The flooring sections have heating, electrical and plumbing connections pre-installed before they are finished with laminate, tile or hardwood. Next, the walls are constructed on a flat level surface with insulation and interior Sheetrock before being lifted by crane into position and secured to the floor sections. The interior ceilings and roof struts are next, vapor sealed and secured to each section’s wall frame before being shingled. Then, the exterior siding is added, along with the installation of doors and windows. Finally, interior finishing, such as sealing the drywall, is completed, along with fixture installation and finishing the electrical and plumbing connections. The exposed portions of each section, where they will eventually be joined together, are wrapped in plastic to protect them for transport. How Are Manufactured Homes Built at the Building Site? With all the building site prep work completed, your new home will be delivered by trucks towing the individual sections on their permanent chassis. The sections will be joined together securely, and all final plumbing and electrical connections are made before a beautiful decorative skirt or facade is applied to the bottom exterior of the house, hiding the chassis and finishing off the look of your home. Inside, paint and carpet are finished to your design specifications, and your home is cleaned thoroughly. In a matter of several weeks, you have a gorgeous new home, built safely and securely in a quality-controlled factory environment and professional installed on your land, ready for years of enjoyment by you and your family!